• Exhibition runs from April 6 – May 27, 2012. • Opening April 6 from 6-9PM. Come to the opening without going anywhere simply by calling (323) 843-4652. • 323 Projects is an exhibition venue that exists as a phone number: (323) 843-4652 visitors call to experience contemporary art 24 hours a day, 7 days a week. 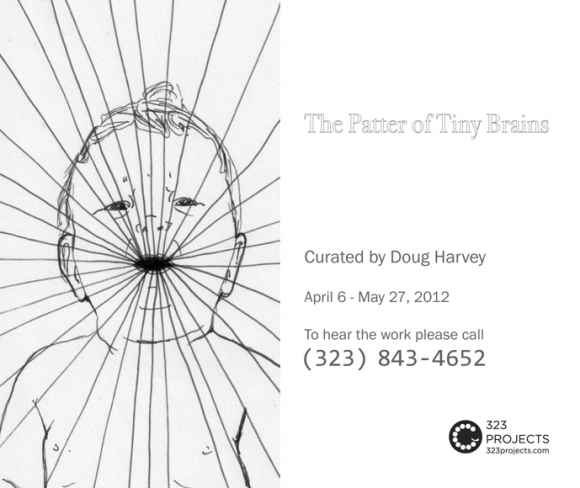 323 Projects is pleased to present The Patter of Tiny Brains, an exhibition curated by Doug Harvey. For this group show sourced from dozens of contributors, Harvey presents a rotating selection of audio generated by children, up to and including adolescents. Visitors who call into 323 Projects’ phone number will hear audio ranging from baby noises to musical performances, and a variety of surprising sound recordings performed by kids. In presenting the work of children, Harvey encourages listeners to bring serious, respectful aesthetic attention to works of performance otherwise disregarded as immature and amateur. This exhibition challenges value systems that deem children’s creative output trivial or inconsequential, and instead critically and enthusiastically seeks to reframe the discourse surrounding notions of youth, professionalism, and creative expression. The show is open all day and all night, every day of the week. Visitors are encouraged to call back often to hear audio tracks, as works will rotate throughout the course of the exhibition. A new interpretation of The Ring Cycle as presented by the LA Opera created and produced by Alejandro Cohen’s class of experimental music/sound collage made up of teenage students from continuation schools in the Los Angeles area for The HeArt Project. Long Ranger & Tonsil are an experimental group founded in 1980 by Andy Sykora and Blake Baxter, both 13 years old. These recordings are from 1980 and 1981, and took place in suburban garages in the San Fernando Valley. The recordings are decidedly poor by any engineering standard, the instrumentations are brutal, and the musicianship untutored and raw. However, in attempting to mimic their favorite commercial rock sound, these teenage practitioners achieved something more: a “musical” tribute to the nonstop, antagonizing white noise of Southern California’s lurching transition into the Reagan years, a dystopia where only sheer volume and overwhelming mediocrity succeed in standing out from the hideous background noise of the ever-expanding nothingness would become contemporary American suburbia. amy drezner – broken manipulated frequencies/tempo sung by 9 yr old gilr in talent portion of child beauty pageant lyrics: “Wake up to a sunny day not a cloud up in the sky, then it starts to rain My defenses hit the ground, And they shatter all around. So open and exposed. I found strength in the struggle. Face to face with my trouble. (Chorus) When you’re broken in a million little pieces and you’re tryin but you cant hold on anymore. Every tear falls down for a reason. Don’t you stop believing in your self. When you’re broken. Haron Abbas Mansour, Shiran Davidi and Lee Korenfeld – Greetings & FC Barca Children United is an organization that operates in Israel and Palestine (among other locations) and uses sports as a tool for peace. Submission coordinated by Maria Ana Sampaio Nunes. Lauren Michele Kasmer – Two Boys at Pig Party an audio excerpt from footage taken for the LMK Thoughtful Food Project a multi media art installation with interactive components including the LMK Thoughtful Food Video with Culinary Performances and other stories. Lili Bernard and Family – Friday Flu Funk Created April 2, 2012; Description: A real morning in the life of the Bernard Ferguson Family, featuring children, Zion Bernard Ferguson (3 years-old) and her five big brothers, Joshua Bernard Ferguson (7 years-old), Uriel Bernard Ferguson (10 years old), Elias Bernard Ferguson (11 years-old), Isaiah Bernard Ferguson (12 years-old) and Rafael Bernard Ferguson (14 years-old), with the children’s parents, Lili Bernard and Franklin Ferguson, in supporting roles. Musical score: “Lick” by Dan Rodriguez (who is the children’s Tio Danny, Lili’s brother). Pitywood Trio – Mmm- Egg? Woodpity Pitywood is a one-year-old Los Angeles-based multi-media artist and musician. This recording compiles several of his improvisations into a single performance.